This article shows how to get the Received Signal Strength Indication (RSSI) to your flight controller. The Frame Error Rate (FER) indicates, if the receiver has trouble decoding a received data package sent by the transmitter. The value is similar to RSSI. The FER information is implemented within the Futaba S.BUS2 datastream. It is not transmitted as a continuous value, but is sent in 25% resolution. To extract the FER from the Futaba S.BUS2 datastream, a S.BUS2 to Analog DC voltage converter can be used. 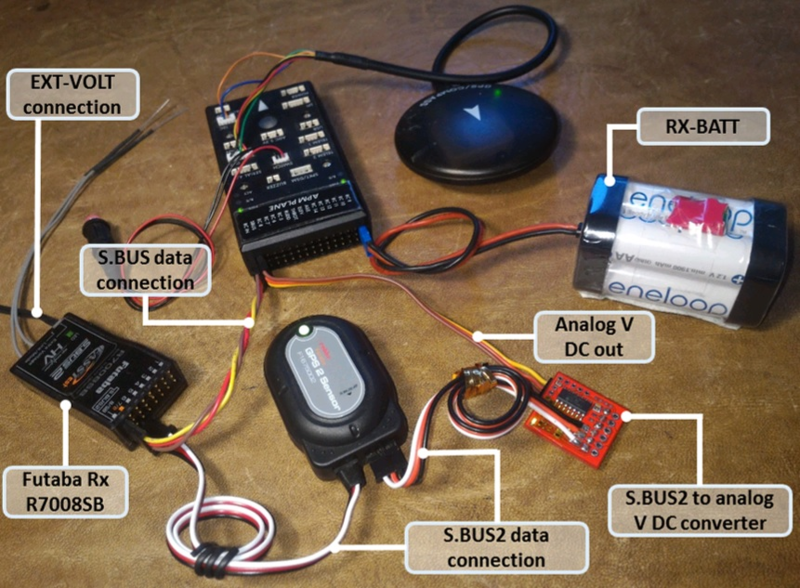 A basic setup using a Futaba R7008SB receiver and an additional S.BUS2 GPS Multi Sensor is shown in the image below. A similar setup should work using a Futaba R7003SB receiver. To enable S.Bus and S.Bus2 protocol on your Futaba receiver, you have to set your R7008SB receiver to “Mode B” or “Mode C” and your R7003SB receiver to “Mode A”. Check out your R7008SB or R7003SB user manual for further details. Connect your flight controller hardware via USB to your computer and open Mission Planner Software. Connect your flight controller using the “CONNECT” button . Goto “Full Parameter List” tab . Goto “Search” input field and enter “rssi_” . Choose an input pin on your flight controller where you want to input the analog voltage output of your converter [5.1]. In this example we set “RSSI_ANA_PIN” to “103”. This means, analog DC voltage output of the converter must be connected to “SBUS” input pins of the flight controller as shown in the image above. Enter your calibration voltages for “RSSI_PIN_HIGH” [5.2] and “RSSI_PIN_LOW” [5.3] according to the Note shown below. Set “RSSI_TYPE” to “1” [5.4]. This means, your flight controller is set to accept an analog voltage on the input pin you set in step [5.1]. Write the parameters to your flight controller by pressing the “Write Params” button . Note: All other “RSSI_*” parameters shown in the list are not used by the flight controller when “RSSI_TYPE” is set to “1”. They can be ignored. In addition to the S.BUS2 to Analog conversion, the converter is looping back the FER / RSSI value to the S.BUS2 datastream simultaniously. This feature enables all users of FASSTest Telemetry capable transmitters to setup a Telemetry RSSI Feedback as an option. Moreover an audible and/or vibration alarm can be set to notice when received signal quality is degrading. To use this feature, the “FASSTest-14CH” protocol has to be enabled in your transmitter. Enter the “LINKAGE MENU” by double clicking the “LNK” button . Goto “SYSTEM” and press “RTN” . Within “SYSTEM” menu, goto the protocol selection tab and choose “FASSTest-14CH” protocol  . In case you changed the protocol, eventualy you have to re “LINK” your receiver to your transmitter . 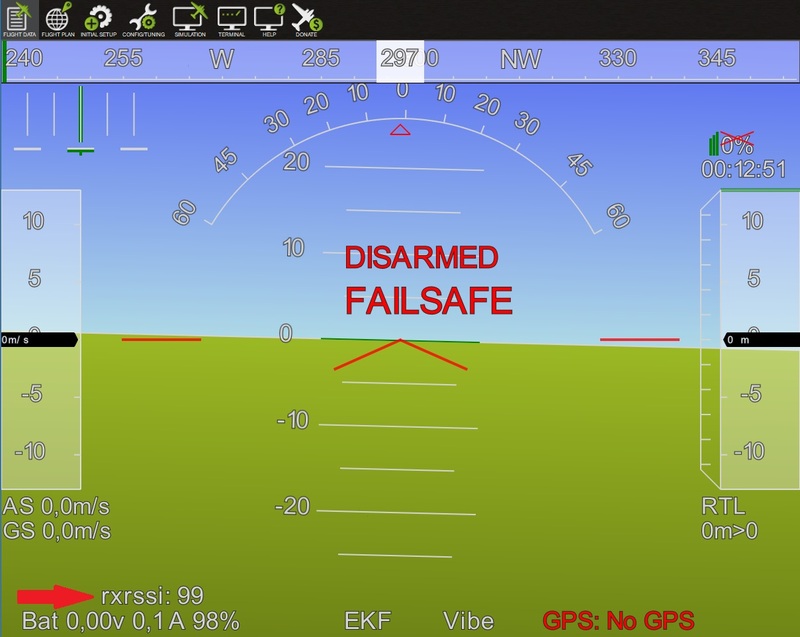 Ensure, that TELEMETRY is set to “ACT” . Due to the fact that Futabas Telemetry Sensors can’t be renamed, the transmitted FER / RSSI value appears as a simple “temperature sensor”, wheras “0°C” means “Rx in failsafe” and “100°C” means “Rx received <= 100 % good frames”. The converter is reporting the current FER / RSSI value into Slot 1 of S.Bus2 Telemetry datastream. Enter the “LINKAGE MENU” by double clicking the “LNK” button. Show page 2 of the menu by pressing “S1” , goto “SENSOR” and press “RTN” . Goto Slot 1 tab and press “RTN” . Choose “TEMP125” Sensor and confirm the selection by pressing “RTN” two times . Slot 1 should be assigned with a “TEMP125” Sensor now . If so, leave the menu by pressing “HOME/EXIT” button two times. Enter the “TELEM.MONI” menu by pressing the “HOME/EXIT” button . Goto “RECEIVER” and press the “RTN” button . Goto DISPLAY tab  and choose “3” . Goto “SENSOR”  and choose “TEMP125”  and confirm with “RTN”. Press “HOME/EXIT” to return to “TELEM.MONI” display and to see the RSSI / FER value as a “Temperature” . To set alarms, goto “TEMP”  and press “RTN”. For alarm setup please refer to your Tx user manual. As soon as you connect your receiver with power, the FER / RSSI value will show up as well as the standard received signal quality indicator . The converter can be mixed with other telemetry devices as long as they are assigned to Slot 2 to Slot 31 . Select the input pin with the RSSI_PIN parameter. However some of receivers such as FrSky D8R-XP output 0 - 3.3 V.
For that reason I’ve added new parameter: RSSI_RANGE. When the RSSI_RANGE parameter is set to your radio’s maximum RSSI voltage the RSSI rxrssi is shown in the range 0-100. A 4.7k resistor and 10uF capacitor are used to filter out the pulses from the receiver’s RSSI output. Both EZ-UHF and OpenLRS have the option of embedding RSSI into a PWM channel, saving you from having to add filters, etc. You can use any channel from channel 5 and up, but keeping the on channel 9 or above will keep your regular servo channels free. RSSI_CHANNEL : Your selected channel from above. Developed and illustrated by Lukasz - Thank You - Hope this helps.